Scleritis is the inflammation of the white of the eye (sclera), a serious and painful condition. The sclera is comprised of tough, fibrous tissues protecting the eye and covering 83 percent of its surface. In majority of cases, scleritis is associated with an underlying autoimmune disorder, such as rheumatoid arthritis, for example. There are two main types of scleritis: anterior and posterior. Anterior is the most common type of scleritis, and is further classified into three sub-types: diffuse scleritis, nodular scleritis, and necrotizing scleritis. Diffuse scleritis is the most treatable form of anterior scleritis. It causes redness and inflammation throughout the sclera. Nodular scleritis is characterized by the presence of nodules and bumps that are tender to touch. Lastly, the most severe form of anterior scleritis, necrotizing scleritis can destroy the scleral tissue and, in rare cases, lead to loss of the eye. Posterior scleritis is rarer than anterior scleritis. It affects the back part of the eye. Usually not attributed to an autoimmune disorder, this type of scleritis can lead to complications such as retinal detachment and glaucoma. Scleritis is typically associated with an autoimmune disease – a disorder in which the immune system begins to attack its own healthy cells unknowingly. 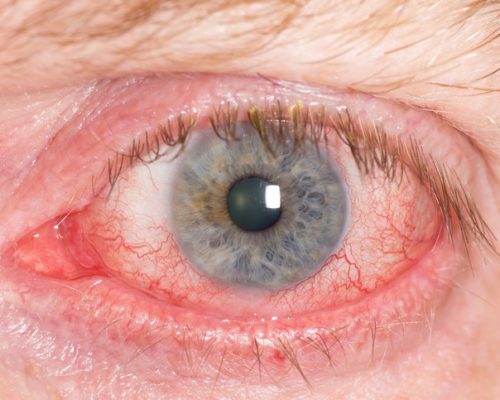 Scleritis has been associated with different forms of inflammatory arthritis, eye infection, lupus, certain connective tissue disease, inflammatory bowel disease, Sjögren’s syndrome, Wegener’s granulomatosis, and scleroderma. Scleritis may also be a result of injury to the eye or caused by a fungus or parasite. Risk factors for scleritis are being a female (women are twice as likely to develop scleritis as men) and having an autoimmune disease. People between the ages of 40 and 50 are also at a higher risk for scleritis. The primary symptoms related to scleritis include pain, redness, inflammation, tearing, light sensitivity, eye tenderness, and decreased visual acuity. Symptoms specific to posterior scleritis include deep-seated headaches, pain caused by eye movement, and double vision. Complications associated with scleritis include inflammation of the cornea (keratitis), anterior or posterior uveitis, glaucoma, cataracts, retinal detachment, retinal swelling, scleral thinning, peripheral corneal shinning, and retinal macular swelling. It’s important to treat scleritis as soon as possible in order to reduce the risk of complications. To properly diagnose scleritis, your doctor will review your medical history and perform laboratory tests. Having a history of autoimmune diseases can help your doctor narrow down on a diagnosis. Other conditions can appear similar to scleritis, so proper testing is necessary to confirm scleritis diagnosis and rule out other conditions. Tests to help diagnose scleritis include ultrasonography to look for changes in the sclera, complete blood count to check the immune system function and check for infection, and a biopsy of the sclera. The first step in treating scleritis is combatting inflammation before it causes permanent damage. This process may involve trial and error as not all medications work equally on different patients. If one medication is unsuccessful, your doctor will switch you to a different one. Medications to help treat scleritis include nonsteroidal anti-inflammatory drugs for anterior scleritis, oral glucocorticoids for posterior scleritis, and immunosuppressive drugs combined with the other medications. Eye drops, topical treatments, and steroid injections are other treatment methods for scleritis, too. Because scleritis is mainly associated with autoimmune diseases, it is difficult to prevent. For the best outcome, it’s important that you see your doctor right away to receive immediate treatment and reduce your risk of complications, as scleritis can lead to serious, permanent damage.